There are many disasters that we hear of in the news. Most of these take place far from our homes and those of our loved ones. This week it hit close to home for us. 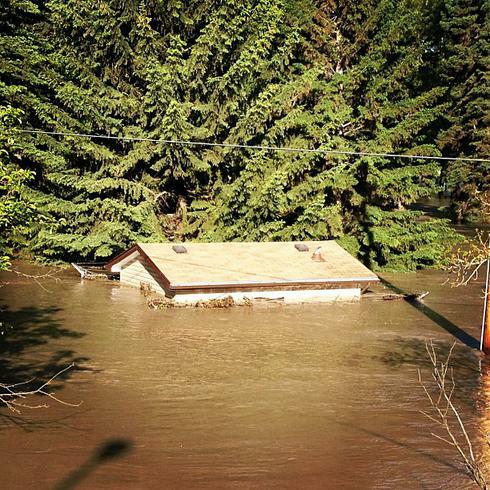 Heavy rains caused massive flooding in Southern Alberta. Streets were turned into raging rivers. The downtown core of a major city was evacuated as the water rose. Bridges and highways were washed out. The number of people evacuated from their homes in many cities and towns was staggering. Most people could not prepare for the flooding as it hit so fast that there was little or no notice. As I think about the little time we have to escape the raging storms that come our way, I wonder if I am doing enough to shore up my life. Have I taken the time, put in the work, to ensure I will make it through the storms? When the waves of adversity hit, as they do to all of us at some point, will I be swept away? The assurance that I count on comes from my faith in Jesus. He hasn’t promised that there will be no more storms in my life, but he has promised to walk with me as I go through them. He is my refuge and my strength, an ever-present help in times of trouble. This is the assurance that I need.